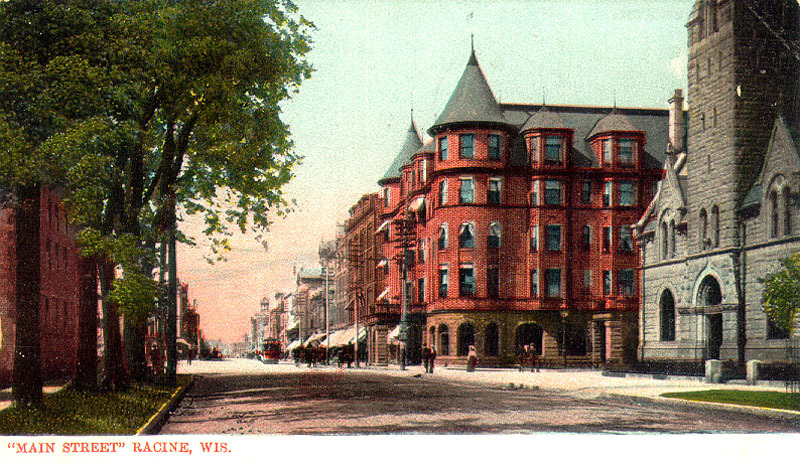 This is the YMCA on the northeast corner of College Avenue and 6th Street, looking east toward the lake and the tower of Hotel Racine. You can make out several signs on the buildings. On the YMCA building, there is a sign on the 2nd floor that says “Night School for Men” and on the 1st floor, “Electrical Supply.” Across 6th street is an awning that says “O. 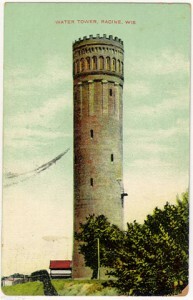 A. Peil Co.” The postcard itself is postmarked 1910. 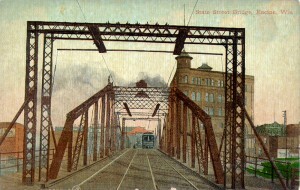 The “High Railroad Bridge.” Postmarked 1908. That is the northwest corner of Main & 5th St.
Postmarked 1908. 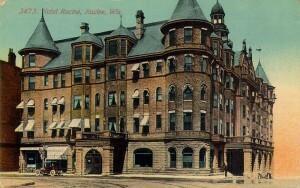 In this view of the Hotel Racine, the brick part of the building has been hand-tinted red. 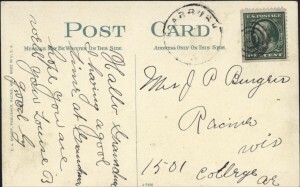 Postmarked 1911. This view of Hotel Racine is hand-tinted yellow. I would like to know what hundred block of College Avenue this shows. The house at the far right looks very much like 1405 College Ave., where I grew up, but it seems to be in the wrong part of the block. 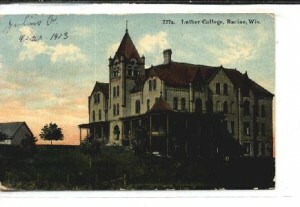 Luther College postcard, postmarked 1913. According to Racine: Growth and Change in a Wisconsin County, Luther College was founded in 1902, on the hill above Island Park. 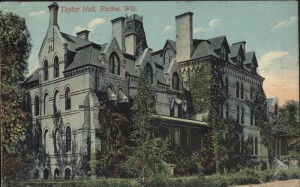 The College was operated by the Danes, and was actually a high school. 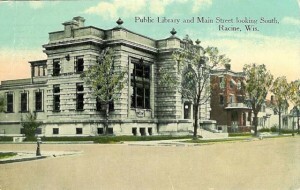 It closed in 1914. Monument Square, looking southeast, with a nice view of Hotel Racine and the old Post Office. 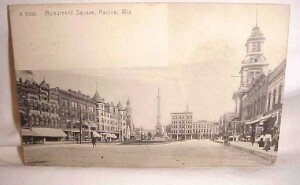 Monument Square panorama, postmarked 1909. Palmeter, or “Old Ladies’ Home”. 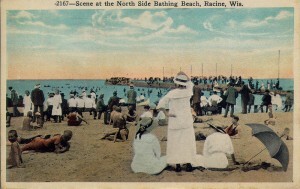 This postcard is postmarked 1913, and was sent to someone in England. This building is at the northeast corner of 16th and College Avenue, and I walked past this building many times because it’s only two blocks from the house I grew up in. 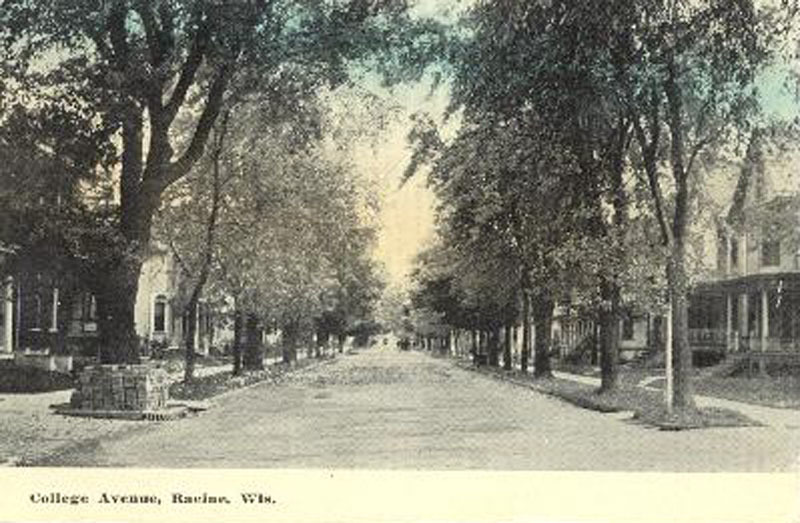 It used to have a beautiful back yard that stretched to Wisconsin Avenue, but they eventually sold the Wisconsin Avenue half to someone who moved a house from near Gateway to this new site. “St. 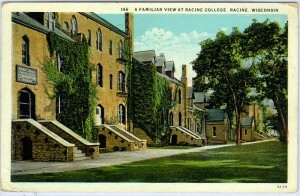 Catherine’s High School and Convent, Racine, Wis.” I don’t know when this card is from — it’s not postmarked. However, I finally understand how St. Cat’s convent was oriented to the school. I always thought it faced on College Avenue, not Park Avenue. One of the most unusual pictures (or paintings?) 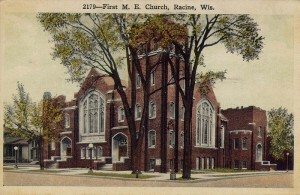 of Racine that I’ve seen. It shows Main Street at night, postmarked 1914. 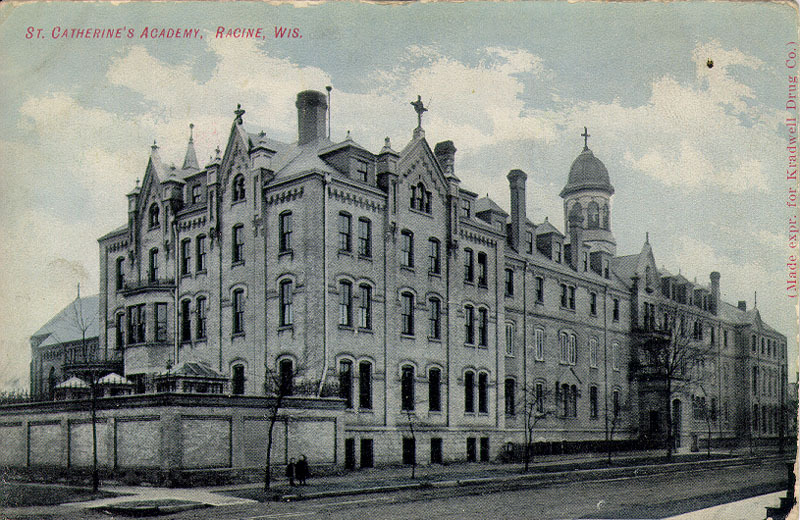 This is a great picture of St. Catherine’s Academy on a postcard postmarked 1908. 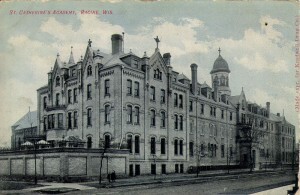 The Academy used to face St. Cat’s high school across Park Avenue. 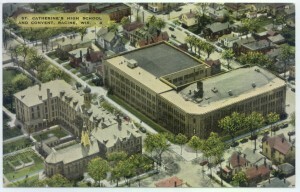 You can just barely see the front steps to the high school in the lower right part of the picture. I also like that there seem to be two little kids on the sidewalk in front of the wall on the corner. Also printed on the front of this card: “Make expr. for Kradwell Drug Co.)”. I can remember my parents protesting when this beautiful building was torn down. They talk about the crane operator knocking the tower off with his wrecking ball. This is a classic example of some of the most beautiful houses in Racine, the houses made out of “Chicago cream” bricks. I particularly like this postcard because someone has obviously taken a lot of care and pride in preparing this house for its picture. Take a look at the lace curtains in all the windows and the door, the perfectly painted front porch with its elaborate spindles, and the decorative triangle in the upper point of the roof. The two chimneys have decorative bands around them and all the doors and windows are built with an arch at the top. The capitals of the three porch pillars are Ionic with elaborate scrollwork. This is truly fine craftmanship. I wish I could figure out where this house is or was located, but I can’t find any street number in the picture. 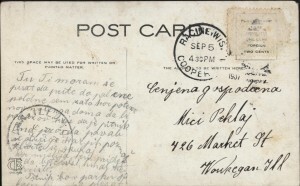 The postcard is postmarked August 9, 1910, 7:30AM, and is written in German. It is addressed to Mr. Ric. 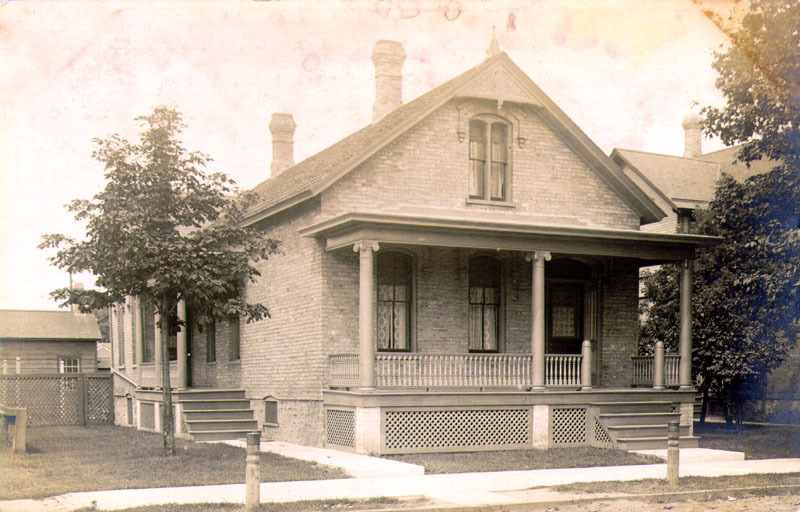 Edelmann, 195 Jefferson Ave., Oshkosh, Wis.
Ruby writes: I came across your photo of an old cream brick cottage. I was intrigued because there’s so many like that on the North side and I wanted to figure out which one it is. I’ve been looking and looking, in person and on Google Street View. I think the address is 1524 N Main. The front porch is gone, there’s a window where the front door was, and it looks like one of the chimneys is gone. But the house next door matches up, and the St Joseph’s church steeple behind it seems to match. 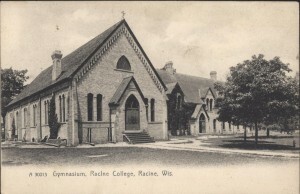 This postcard is something of a mystery to me because I can’t seem to locate McMynn School in Racine history. 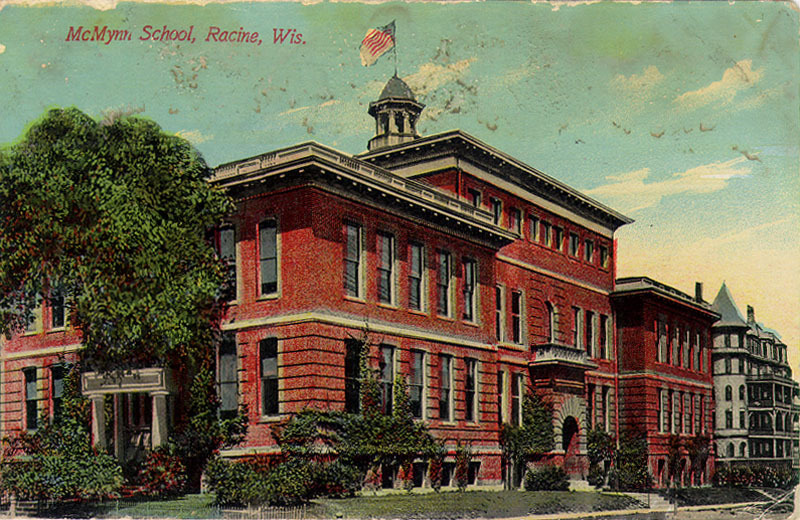 The building to the right of the school appears to be the east side of the old Hotel Racine, which would put this school to the east of the Post Office, but I could be totally wrong. 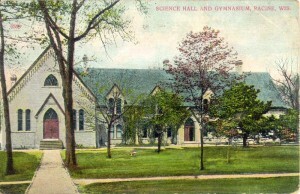 The postcard is postmarked August 9, 1910, but the only references I can find to the McMynn school talk about the 1940s. Very strange. 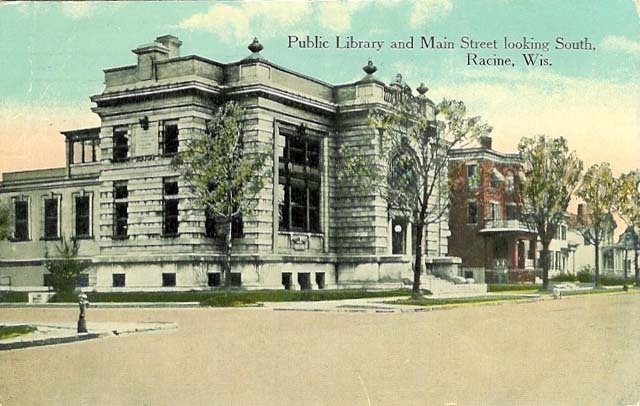 Update: Bob Sorenson writes, “Was looking through your Racine history site and the caption with an image of an old post card of the McMynn bldg indicated you did not know where the bldg was. Perhaps you have since found out. 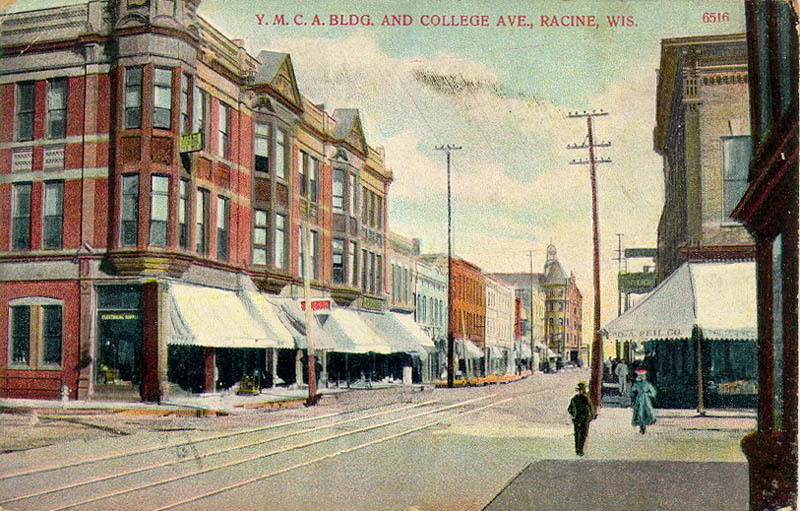 I grew up in Racine from 1955 to 1973 and have living in California since 1982. 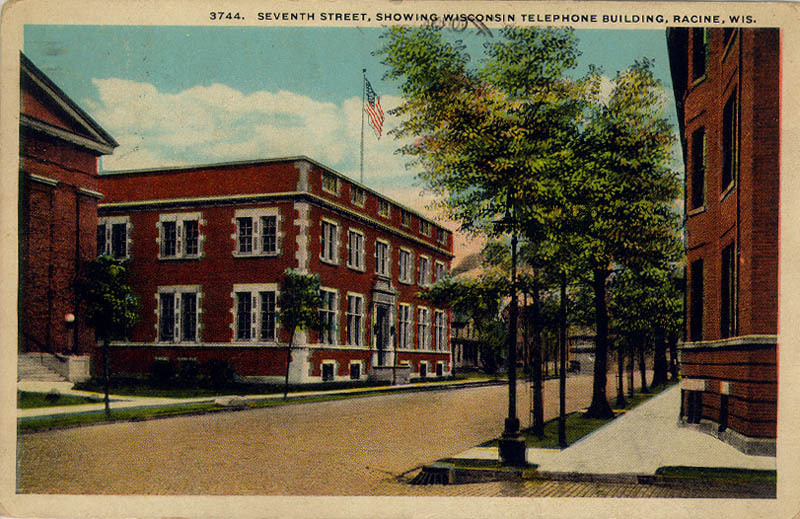 The McMynn building was a school built katty corner from the current library. across the street from Memorial Hall. I attended my senior year of high school and the first year of Walden III, Racine Alternative High School in 1972-73 in the McMynn bldg. I don’t recall how long Walden III continued to use the school. It was an exciting place and time. 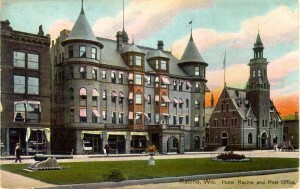 The building was removed to build what is now senior citizen apartments. So the corner was 7th and Lake. I am unfamiliar about the previous history of the bldg.”From a 1941 Journal-Times article sent in by Russ Noble:Hire Principal. On Feb. 14, 1853, Lucius S. Blake was selected as the contractor and the work was begun. 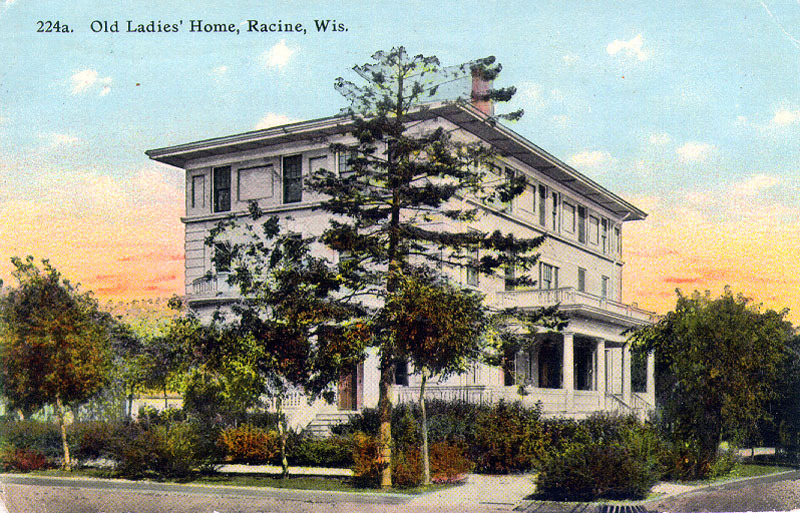 Lucas Bradley, an early Racine architect, manufacturer and builder, drew the plans for the building. He was paid $50 for his work.While the school was ready for occupancy in August, it was not finished until the second week of December. The building was made of brick, 50 feet by 75 feet in dimensions and was two stories in height with a large basement.The school board voted Aug. 20, 1853, to hire John G. McMynn as principal at a salary of $800. He held the position for eight years. The present McMynn school is named after him. F. B. Downs was selected to head the intermediate department at a salary of $500, and Mrs. Eleanor Wiley McMynn was named to the teaching staff. 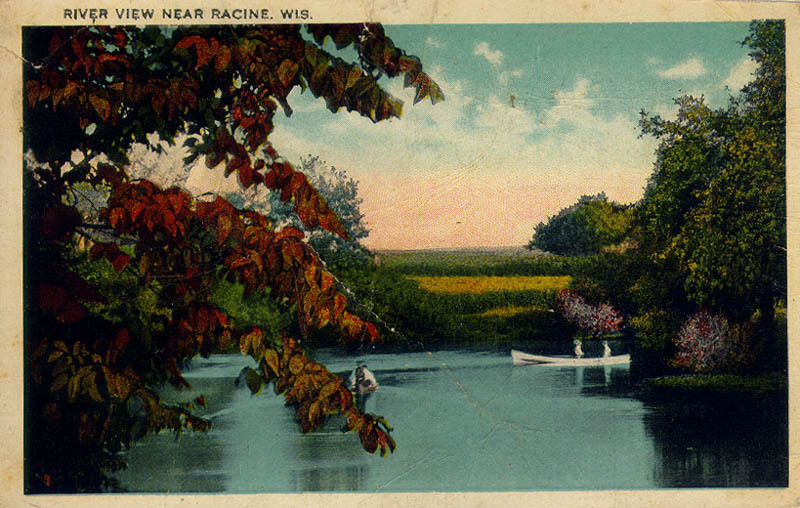 While I was living in Racine (1970-1987) this was one of my favorite places to explore — along the river, upriver from the Schoop Building. 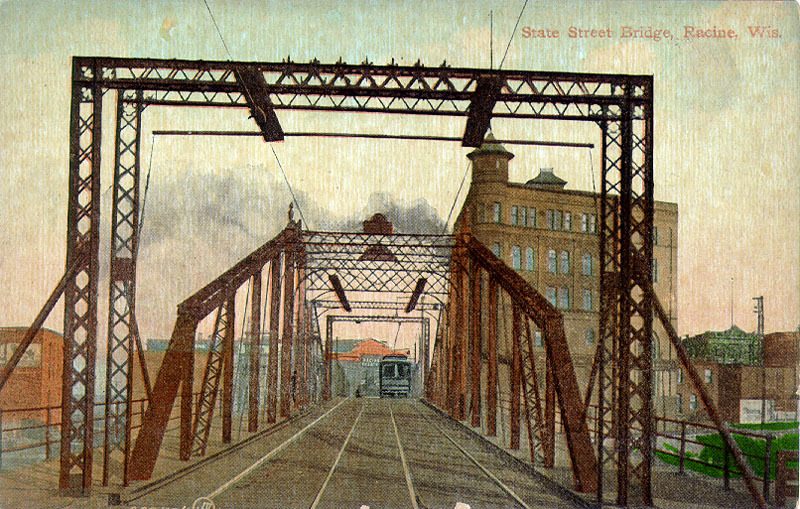 I think there were still railroad tracks at the time, and I can remember seeing where the 4th Street Bridge connected on either side of the river, but I didn’t realize that it was the turnaround type of bridge. The D.P. Wigley building seems like it’s been exactly the same for years, at least as far back in pictures and drawings that I’ve seen. 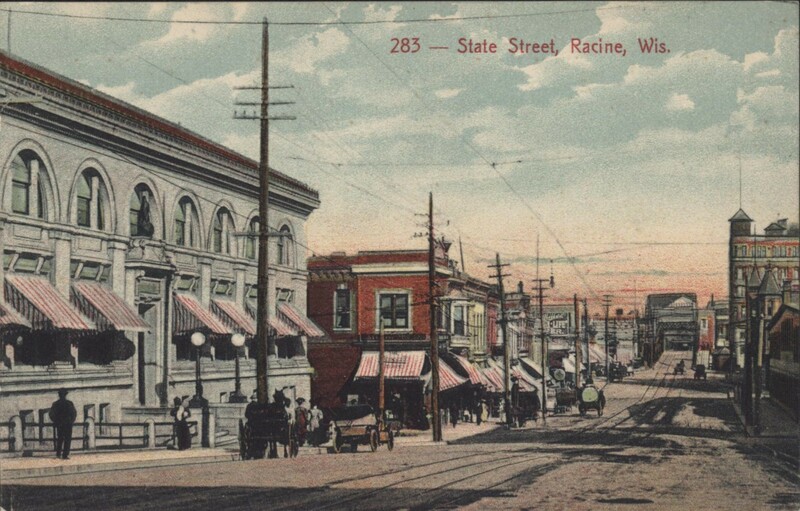 For instance, in the bird’s-eye-view map of Racine called “Racine Wis. County Seat 1883 of Racine Co.”, it looks the same, although it’s marked the “W. T. Emerson Linseed Oil Manufactory”. 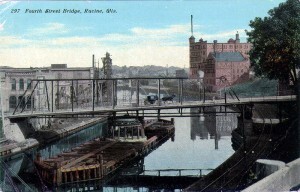 On the left side of the bridge, you can see a building with a sign on the side of it that says, “Racine Woolen Mills,” which is what that building is called in the 1883 map. This postcard does not have a date, but my best guess, based on the cars would be late 1940s, early 1950s. What do you think? 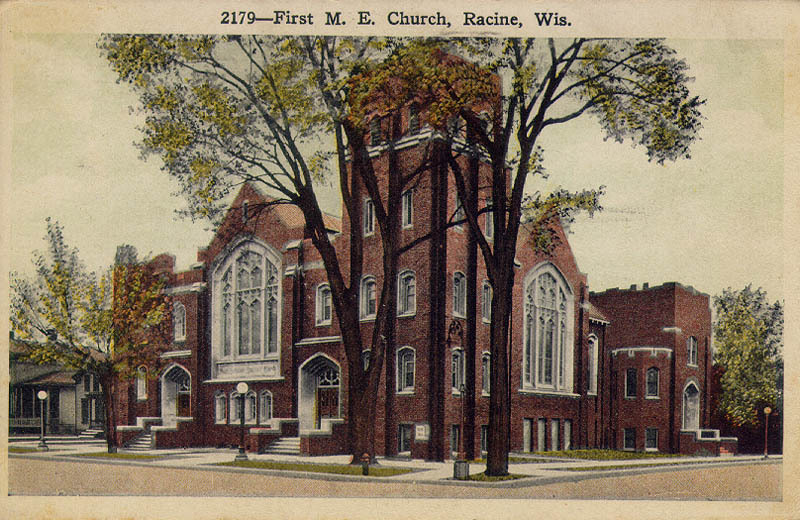 Since I was six when I arrived in Racine in 1970, I remember going on errands with my dad, and one of the trips was to a building that I remember being across the street from the Courthouse. I think it might have been a tire store, but I remember trolley tracks across the floor. Could it have been the building east of the Courthouse with the curved roof? 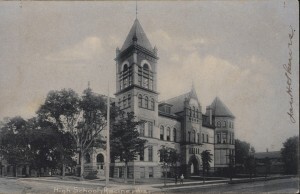 This is a nice view of the old library at 7th and Main, diagonally across from St. Lukes Episcopal Church. I grew up two houses down from Jennette Schroeder, who lived at (I believe) 1413 College Ave. In any case, she was two houses south of my house at 1405 College. She was in her 70s when we first got to know her and she became a family friend. I took piano lessons from her for many years. She lived in the house she grew up in with her parents and brother, and she still kept almost all the furniture as it was in the 1920s or 1930s. 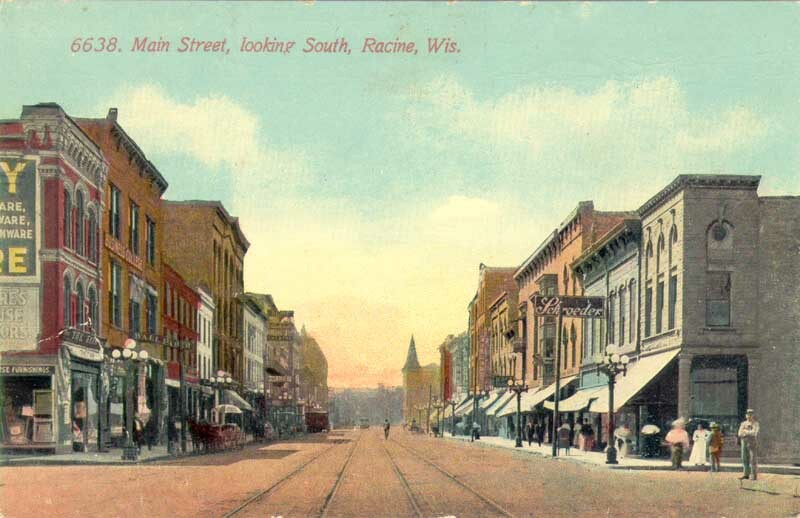 Jennette mentioned on several occasions that her father had a dry goods or 5-and-dime store downtown, so when I found this postcard, I had to have it, because she never showed us any pictures of the Schroeder store. 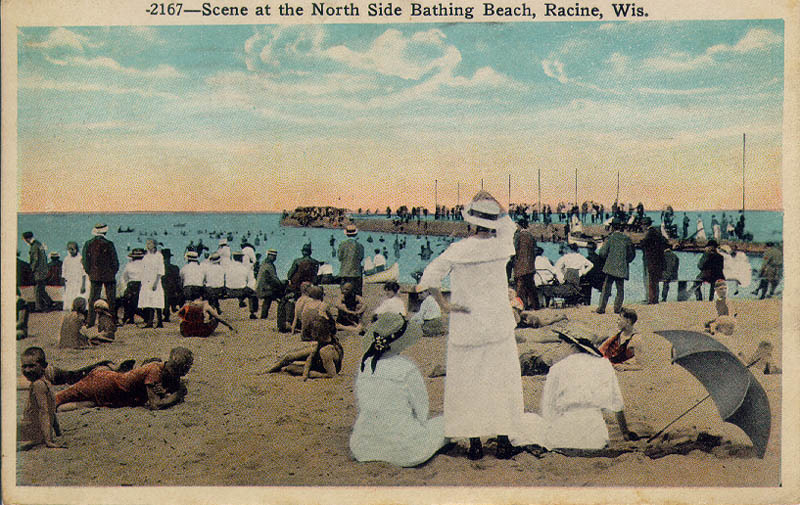 I always keep an eye on the Racine postcards that are being sold on Ebay, and I believe I have an example of almost every Racine postcard out there. 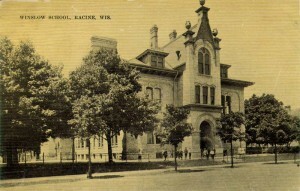 But this was a new one for me — a postcard of Winslow School showing the door on the 1300 block of College Avenue. This was my elementary school for kindergarten through 3rd grade and I lined up at this door many times. The lower thumbnail is linked to an enlargement of the kids watching the photographer.I noticed two interesting things about this picture: first, notice the “urns” up along the top of the facade — these were long gone by the time I went to school there in the 1970s; second, notice in the main shot that there are two little girls standing further back toward the right side of the picture. According to my neighbor Miss Schroeder, the girls played on one side of the school while the boys played on the other side. I’ve always liked the State Street bridge because it is small and fun to boat underneath to look at all the huge gears and so forth, so I was really surprised when I found this 1924 postcard of a huge ship making its way upriver, probably to load or unload at the many factories on the river. It doesn’t look like it would be able to turn around, though — would it have to back the whole way down the river? 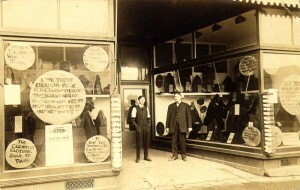 This is a “real photo” postcard dating from 1906 or so of a clothing store, probably on Main Street. Note the glass boxes of collars on either side of the entrance. I like how well-dressed the two store employees are — wonder if they made their own clothes, or if they had an employee discount? If you look behind the man on the left, you can see a reflection of the street scene in the glass of the door behind him. Also, the man on the right seems to be holding something in his right hand — scissors, perhaps? 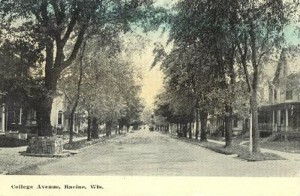 This postcard is marked “Columbia Corners.” It looks to me like the curve of Washington Boulevard in Uptown. Another view of the earliest Hotel Racine. I like this one because you can see the small businesses that rented space from the hotel. 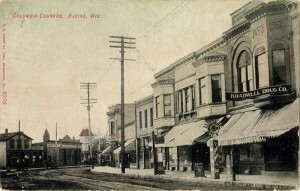 Starting from the left, there is a barbershop — possibly Hotel Barbershop — that advertises baths. In the middle appears to be Carpenter & Nowland offering insurance, real estate, and loans, and on the right, Dietrich something — maybe bar. 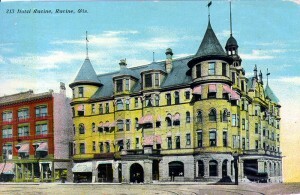 The building to the left (north) of the hotel seems to be 523 Main Street, and has the name J. R. Folwell in the window. 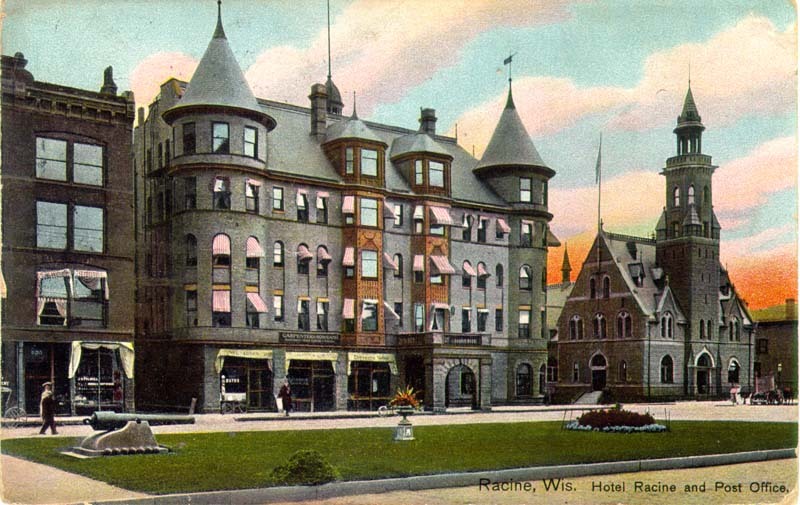 According to the Racine Heritage website, this first Hotel Racine existed from 1895 to 1925, and was demolished because of a lack of modern plumbing. 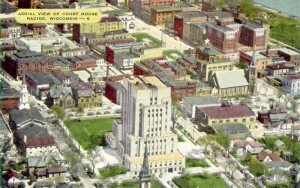 Taken from what is now City Hall, facing northeast. 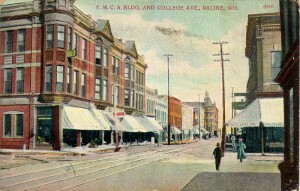 The row building at the lower left is still there. 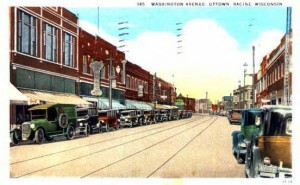 The switches in the street car tracks are for the line to go out Washington Avenue, and the line to the lower left goes west out Sixth Street. You can see the structure for the gas tank at the lake front in the background. 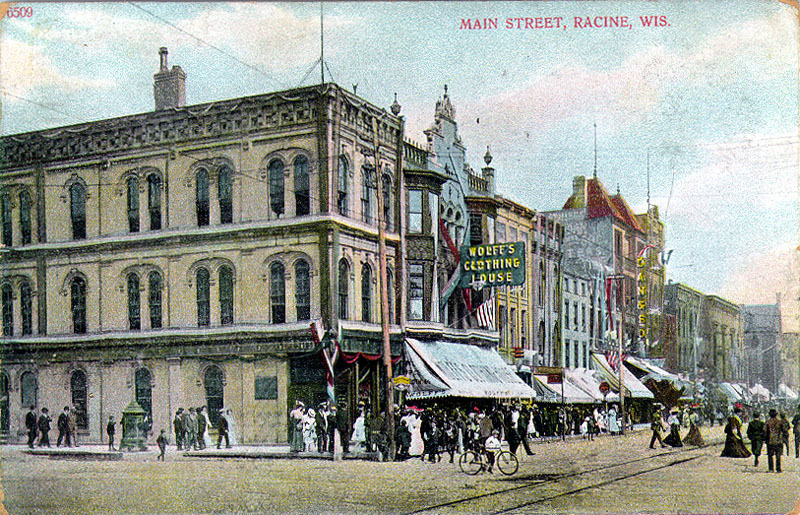 Here is Racine’s first city hall which sat at the corner of Main and Third Streets. 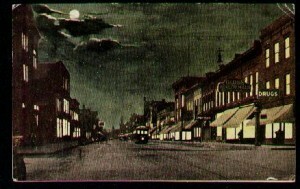 The “Drugs & Cigars” advertisement on the opposite corner is probably for Pokorney’s Drugstore, a Main Street fixture for many years. 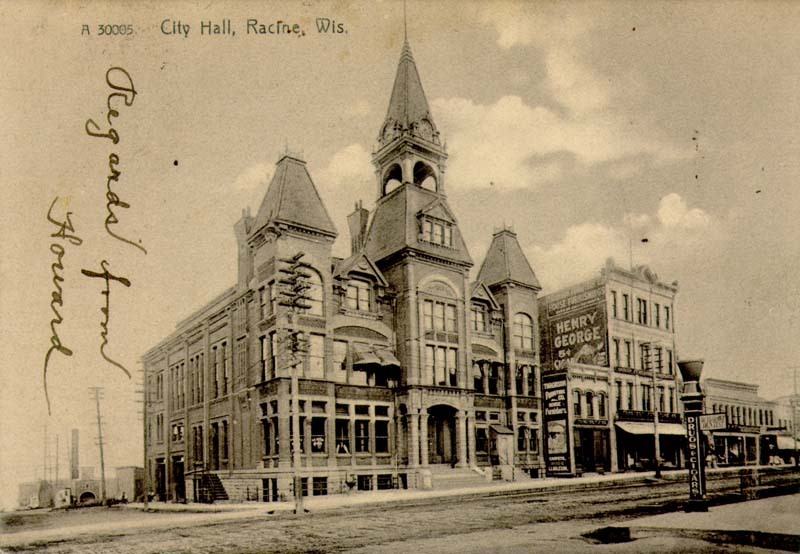 Racine’s 2nd city hall dates between 1877 and 1931, so this first city hall would date from before 1877. Visible to the right of the hall is the Thronson Furniture Company, and don’t miss the advertisement for the $0.05 Henry George cigars. 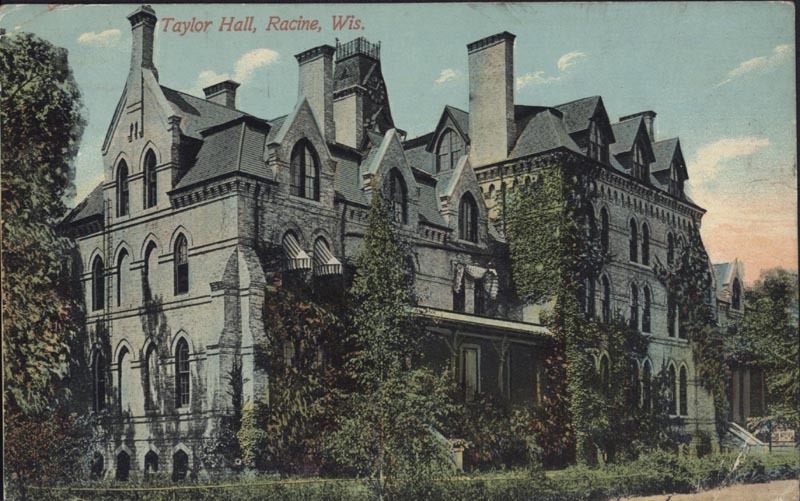 Here is a great picture of Taylor Hall at Racine College/Dekoven. I like this picture a lot because of the porch which I have not seen before. It looks like it’s made out of wood which would explain why it’s not there anymore. Growing up, my family went swimming once or twice at the pool in the gymnasium at Dekoven, and I also remember seeing people playing basketball somewhere in the same building. I particularly like this postcard because of the details you can see if you look closely. For instance, I don’t remember the steps being wooden, and I also like the parallel bars set up outside. Someone has been working on a tall ladder which is lying on the ground on the south side of the building. 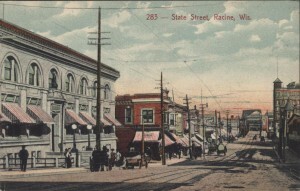 This is an interesting view of State Street from a little bit further west from the previous State Street picture. On the left, you can see the Case building with its statue of “Old Abe” the eagle. In the distance, looking east toward Lake Michigan, is the State Street bridge and the Dr. Shoop building. 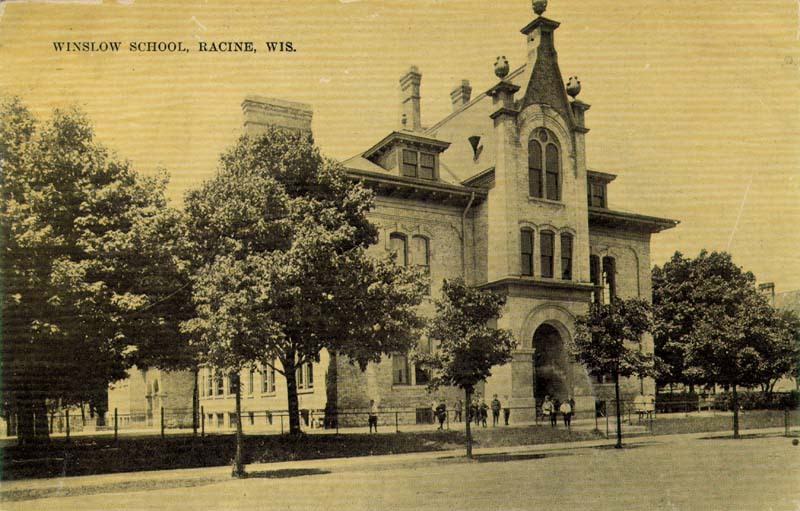 I believe this is the old Racine High School that used to be at the corner of 7th and College, on the same lot as the county courthouse. 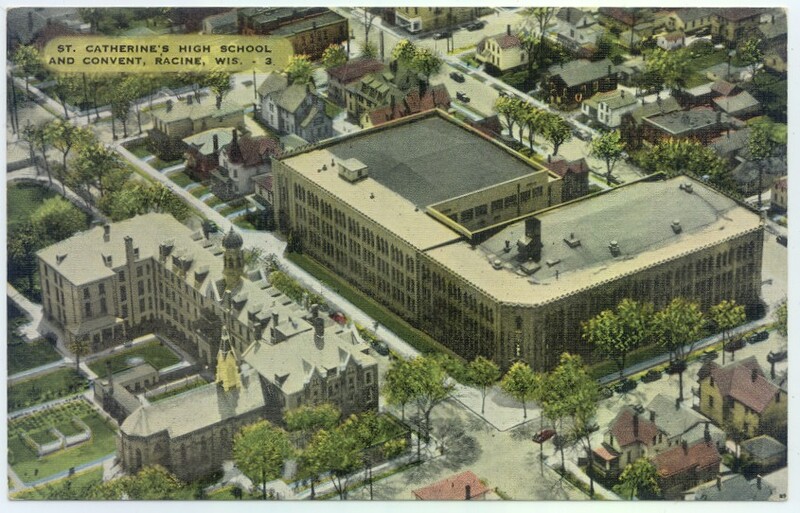 Our family friend, Jeannette Schroeder, attended this school and appears in some of the school’s yearbooks. I have scanned this postcard at 600 dots per inch so you can really zoom in and see interesting details. 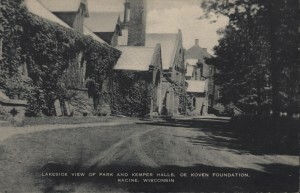 This is an unusual view of Park and Kemper Halls at the De Koven Foundation, formerly known as Racine College. Just when I thought I’d seen all the postcards ever made of Racine College, along comes another one. This is not a particularly attractive photo — it’s not even in focus. However, it does have some interesting details — what is going on with the storm windows leaning next to the base of the wall on the left? Very strange detail. 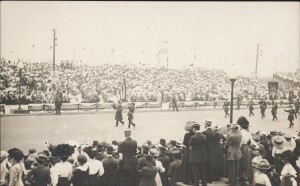 Knights of Pythias in a parade in Racine, about 1910. The Knights of Pythias are a fraternal organization.I like this “real photo” postcard because of how many people you can see in a natural, unposed state. 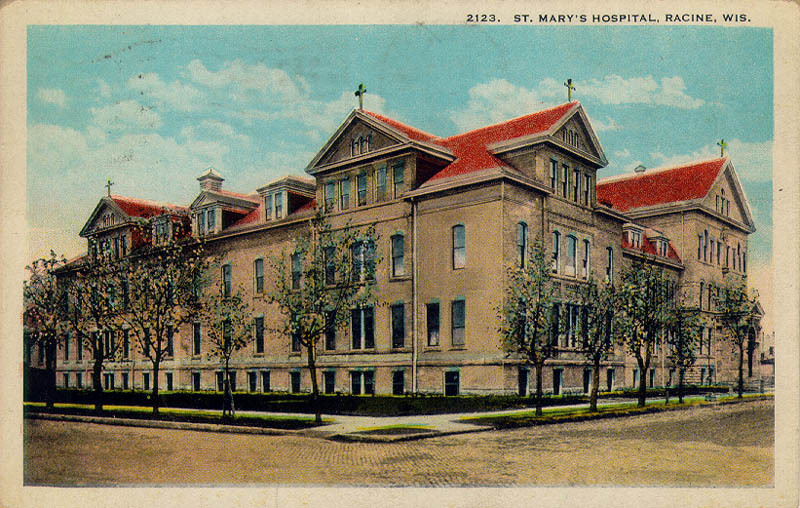 This is a nice, early photo of St. Lukes Hospital. This appears to be the view from College Avenue and 13th Street. This section of building still exists. 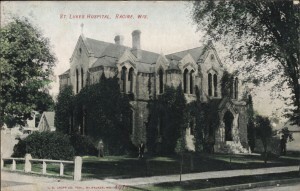 St. Lukes Hospital was founded by several notable Racine personalities, including Dr. Dekoven, and was built in 1876. 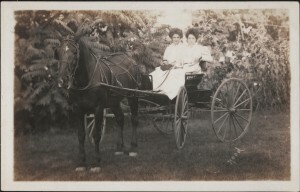 This photo is from about 1910. 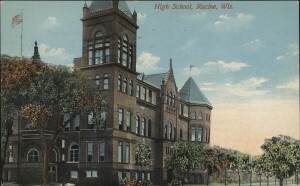 Racine High School, at the corner of 7th Street and College Avenue, at about 1911. 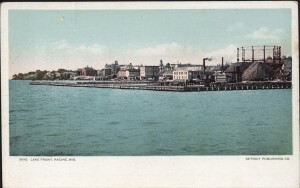 Lake Michigan from 8th Street, Racine, Wis. 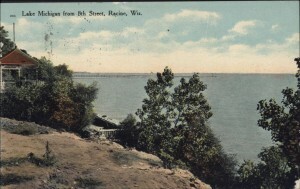 This postcard, featuring a photo from the end of 8th Street, is showing approximately what the view would be from 73 8th Street. Fortunately, we have a nice newspaper article that describes the house that used to sit here and have this view. 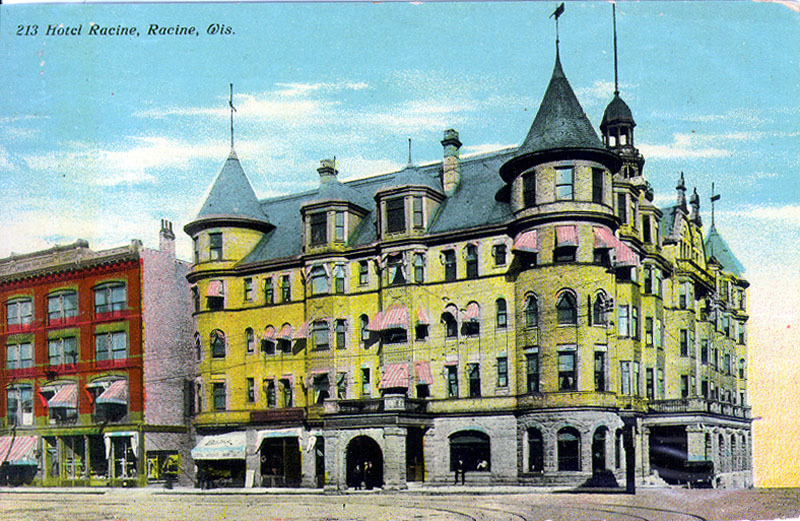 A view of the old Post Office (with Racine Hotel in the background). Letter from brother Johann to sister in Slovenian. 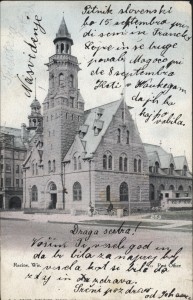 This is a 1907 postcard that appears to be in Slovenian, at least on the basis off the “Draga sestra!” on the front, which Google Translate says is “Dear sister!” Pictured is the old Racine Post Office with the Racine Hotel in the background. It’s hard to read the handwriting well enough to type it into Google Translate, but I get fragments of phrases like “drinking fountains,” “borrowings,” “invitations,’ etc. If anyone knows Slovenian and can read this handwriting and give me a good translation, I would be grateful. This is a nice view of the Court House Monument Square at a time when the Court House directly faced the square and the monument. 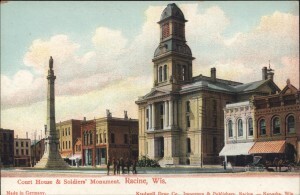 The Soldiers’ Monument was unveiled in 1884, so this postcard depicts the Square as it was sometime between 1884 and 1900.If you click on the postcard to see a larger picture, you can see that to the left of the Court House was First National Bank.This is another postcard that says that it was made for the Kradwell Drug Company, another business close to Monument Square. 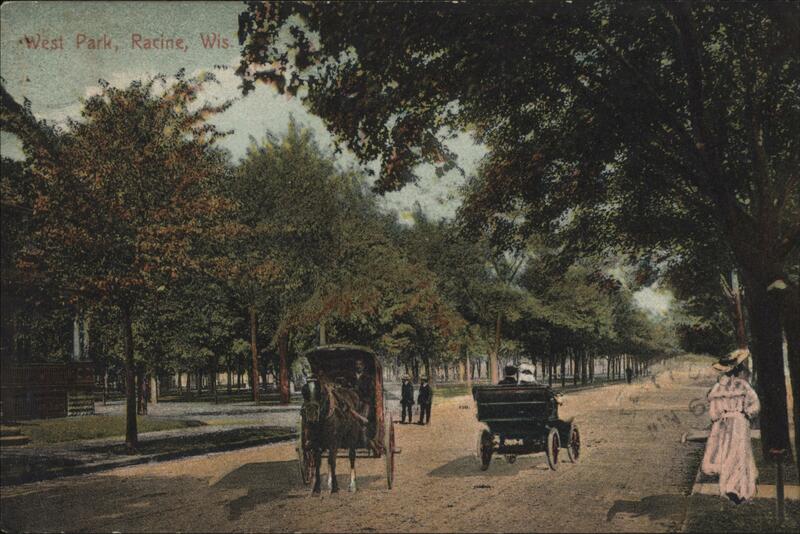 This is a view of the Racine lake front, probably around 1906. 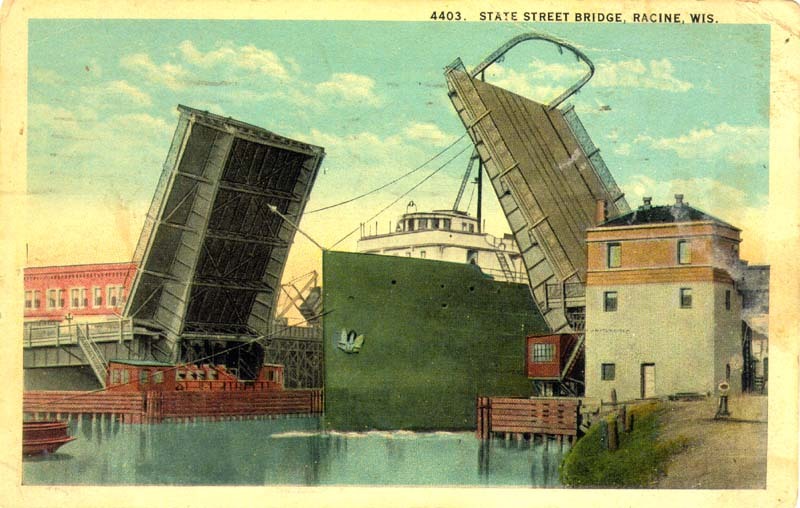 You can see how many factories were taking advantage of being close to the transportation for their goods, ships which worked Lake Michigan. At the right is the expandable tank for the gas works. 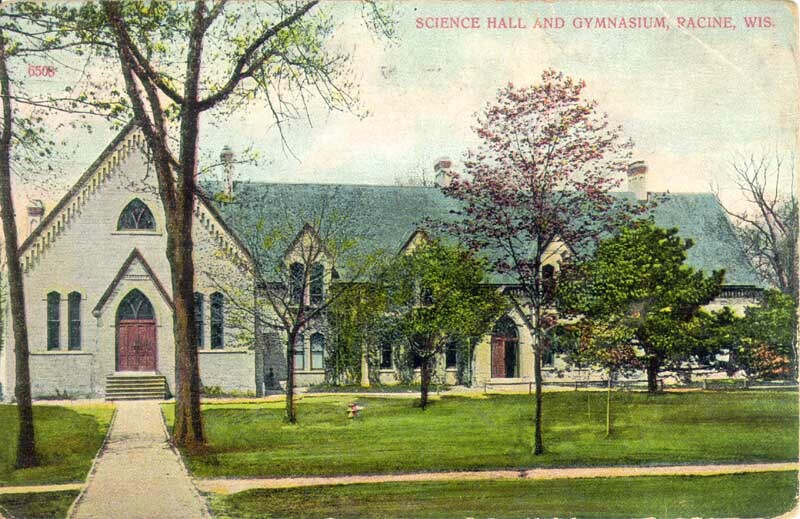 This is a nice view from 1908 of the north side of Winslow School before the addition of the multipurpose gymnasium/cafeteria. 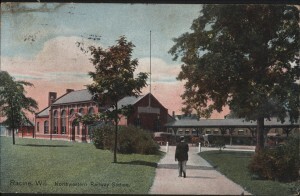 According to my neighbor Jeannette Schroeder, who attended Winslow before 1920, the north side of the school was the playground for the girls, and the south side of Winslow was the playground for boys. 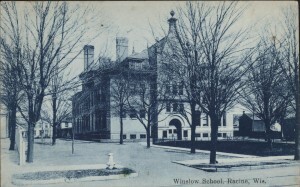 By the time I started at Winslow in the 1970s, the north side was a parking lot for the teachers and all the kids had to play on the playground to the south of the school. Toward the right of the picture there is the back of a large building which looks to me like the barn that belonged to Bill of Bill’s Pet Shop, which was on the northeast corner of the intersection of Park and 14th Street. 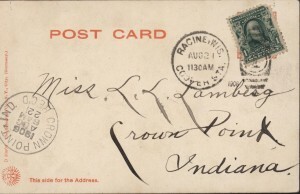 This postcard was for sale on Ebay and I really wanted it, and I set what I thought was a ridiculously high bid on it, since most postcards sell for about $5. 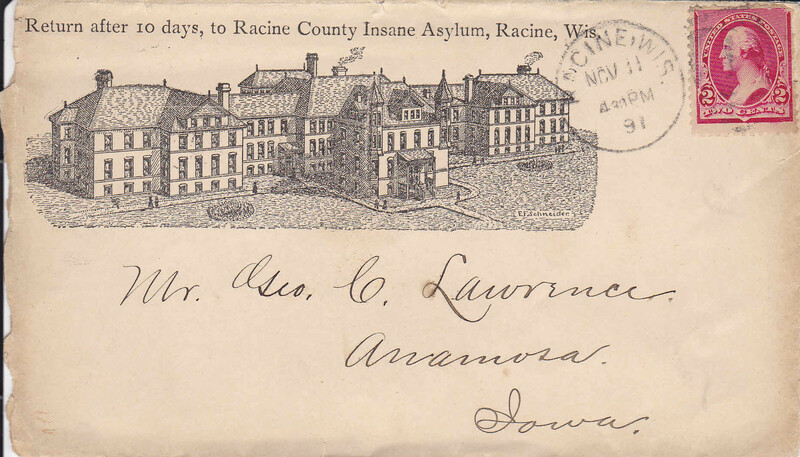 When I got up this morning, I found that I had lost the postcard to a high bid of $64.99! Amazing. 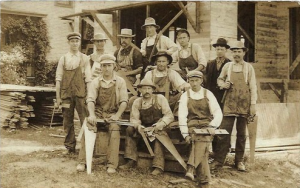 I like this postcard a lot because I had never seen a picture of the crews that built the houses I like so much in my old neighborhood of 14th and College. 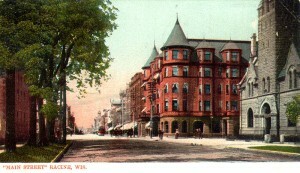 This postcard is supposed to be at 15th and College, so these guys could very well have built my house at 1405 College. I had no idea they were Swedish, for instance. In the background, you can see a few details of how they closed up the frames on the outside with short boards before putting on a final layer of clapboard. 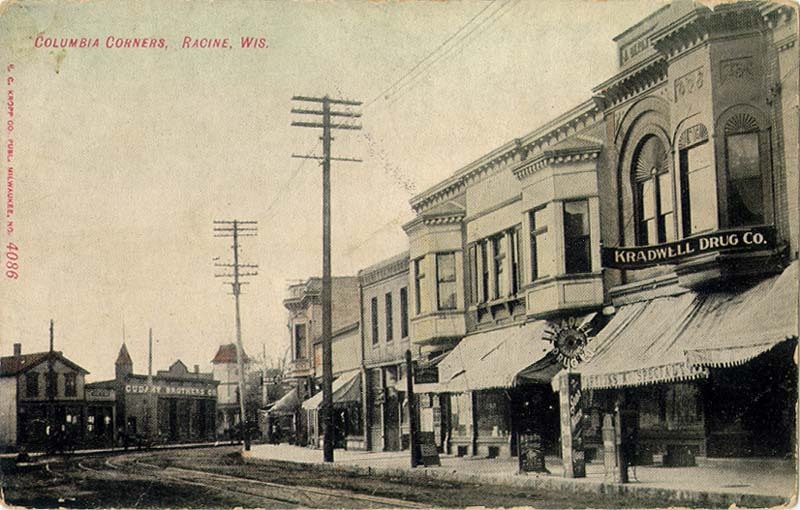 Here’s the Northwestern Railway station on State Street. I’ve only seen glimpses of this place while I was canoeing on the Root River and it was closed up and run-down looking. 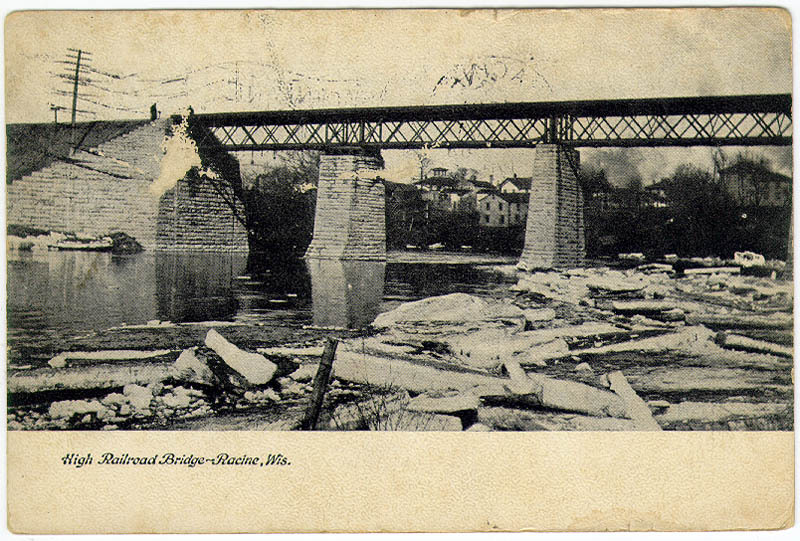 Here it is in its heyday in 1913, looking very nice and well-used. Many old stories of Racine involve giving visitors instructions on how to get to someone’s house from the railway station, usually on foot. Bring an umbrella in case it’s raining! 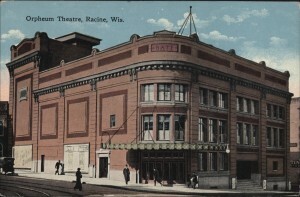 Brilliantly illuminated, decorated with American beauties and other flowers, a magnificent audience and a program of the highest vaudeville merit marked the opening of the new Orpheum theatre in the Bate block last night.It is one of the most modern and up-to-date play houses of similar character in the United States. I had not seen this postcard before, so I feel lucky to get it. It show West Park in Racine, which is a couple of blocks west of East Park. I like the horse-drawn carriage, the early car, and the people out for a walk on what looks like a nice day. 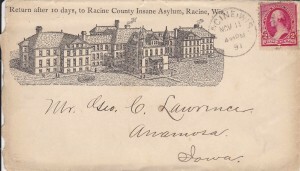 The back of this postcard reads as follows:To: Miss Annie Wise, South 11th Street, Monmouth, Ill.
Just rec’d your card a few days ago from Racine. This postal is of my cos. [cousin] and I taken at Horlick’s Spring near Racine, Wis. I came across your photo of an old cream brick cottage. I was intrigued because there’s so many like that on the North side and I wanted to figure out which one it is. I’ve been looking and looking, in person and on Google Street View. I think the address is 1524 N Main. The front porch is gone, there’s a window where the front door was, and it looks like one of the chimneys is gone. But the house next door matches up, and the St Joseph’s church steeple behind it seems to match. Amazing! I think you’re right! Too bad about the front porch being gone — it had some really nice detail. Thanks for figuring this out! No problem. I drove by there yesterday and the arch where the door was is just a little bigger than the other two. That picture of College Ave reminds me of my grandma’s at 835 College. It looks like it would be facing south, and on the left the apartment building, then my grandma’s would be next, back from the street. But it’s so hard to tell from the picture and lot of the houses there have changed. 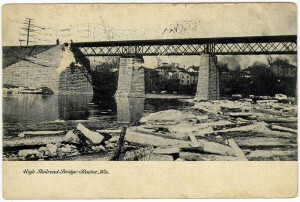 I have some information to add to a couple of your post cards. The one of W. Sixth Street looking northeast. There is a spire towards the right edge with a flag pole atop it. That is Engine House 3, located at 700 Sixth Street. I would say this view is probably what you’d see from the courthouse. 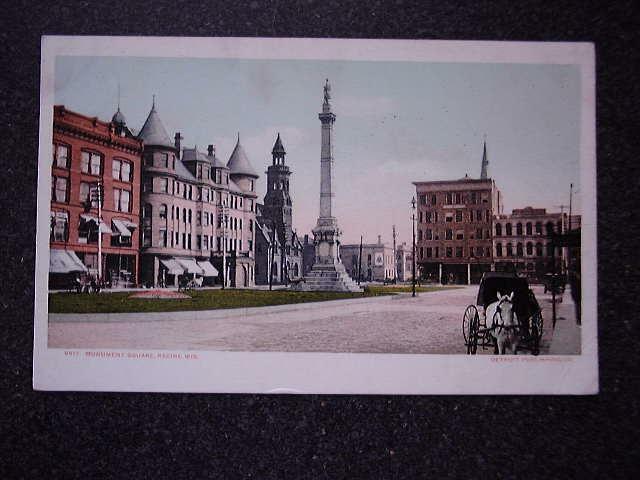 The other one I wanted to note was the city hall postcard you mentioned dated to 1877. This is the city hall at 3rd and Main Streets that was constructed in 1883, following the devastating fire that destroyed everything nearly to Fourth Street. I know this because you can see the two apparatus doors of the city hall engine house on the 3rd Street side of the building. This station was built as part of the overall city hall in 1883. Just thought you might like the added Info. Check out WordPress.com. In terms of copyright, most things made before 1923 are now in the public domain. I will see if I can find out more about those schools’ history for you. 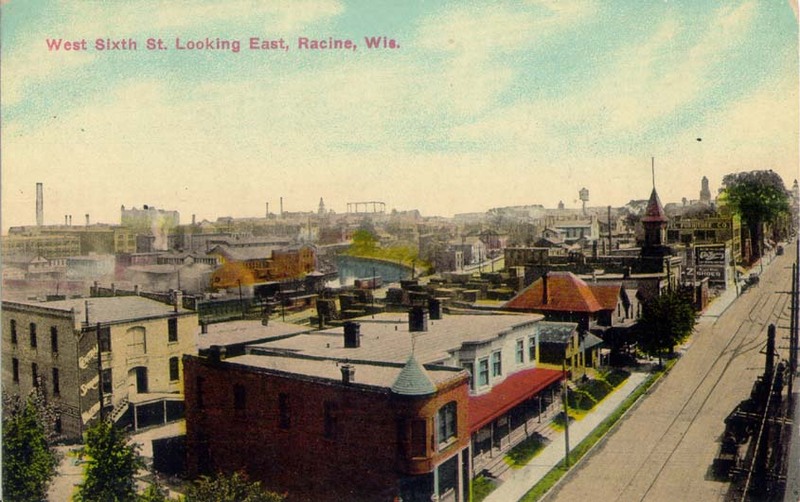 I’m looking for a photo(s) of Lakeview Flats, 700 Lake Avenue, Racine (aka: Chandler Flats) showing the four or less roof line corner conical structures. I found it once, sometime ago, but I can’t recall what source I used. Does anyone know where it can be found? 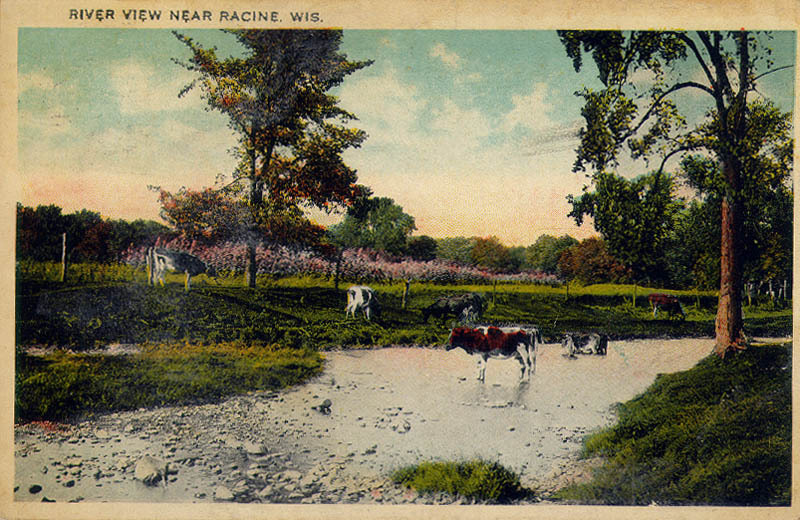 My several times great grandfather, Noyes Thomas Kelly, is listed as a Racine pioneer having moved here as a young man with his father in 1841. His occupation has been listed as photographer and artist. I am not able to find any of his photography or art work. I am wondering if, perhaps, you may have seen his name on a postcard or something.